What started in the 7th century India has eventually become the most popular board game in the world. With its relatively simple rules, yet seemingly infinitely complex tactics, chess attracts players of all age groups. After all, the current chess grandmaster and the current World Chess Champion, Magnus Carlsen, is still in his twenties, earning his grandmaster title in 2004, at the age of 13 years. Chess has something to offer to anyone—from improved concentration and memory to new friends and experiences. While ivory and wooden chess sets won’t ever lose their appeal, most casual players have moved on to digital versions of chess. To find human opponents or to enjoy a quick match against an AI, you don’t need anything else besides your iPhone. 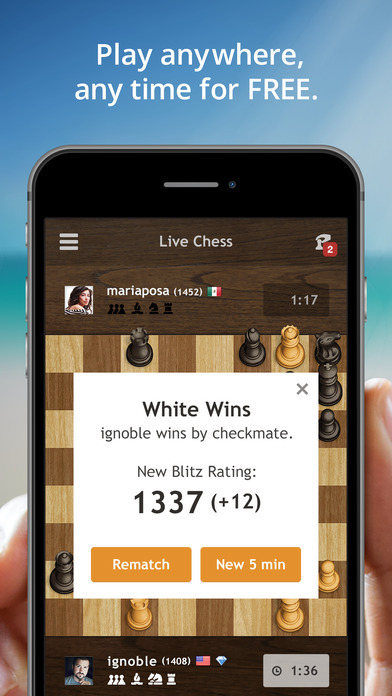 We have selected the most popular chess apps for iPhone in 2019, giving you several fantastic apps to choose from. Want to get your children into the game of Chess? Magnus Kingdom might be a good one to download then. The game comes to fruition because of a partnership between Magnus Carlsen and the guys at Play Magnus. That said, Magnus Kingdom is the fun and easy way for children from 5 years old to learn chess and unleash their cognitive potential. The main goal of Magnus Kingdom is to introduce children to chess rules and strategies so they learn enough to transition to a real board. That said, there’s a smooth progression that introduces children to chess pieces and rules, eventually getting them to a point where they can master Magnus Kingdom, and then smoothly transition to a real board. Chess – Free is just as it sounds. This is a free Chess app that anyone can download to their iPhone. With choices to play as White or Black, you can show your Chess skills to the computer or to a friend. The game supports limited online play in that you can play against friends and family members with a Bluetooth or a wireless connection (you both have to be on the same wireless network). Other than that, there’s tons of awesome computer play. There are over 38,000 chess puzzles to master, but you can also select your difficulty. There are actually 10 difficulty levels, from novice to grandmaster. Originally released in 1993 by Stefan Meyer-Kahlen, a German programmer who invented a widely-used chess engine protocol called Universal Chess Interface, Shredder is a legendary chess program with 12 computer chess world champion titles under its belt. You can either let Shredder shred you by cranking the difficulty setting all the way to the max, or you can take it down a few notches and have Shredder behave more like a human chess player. As you play, Shredder keeps track of your performance and offers helpful tips. If you would like to take your training to the next level, there are over 1000 chess puzzles just waiting to be solved. It’s worth noting that Shredder isn’t available only on iOS. You can download the program for Windows, Mac OS X, Linux, and Android. If you’re a serious chess player and want to improve as much as possible, Shredder is a must-have app for you. Playing chess can be a fulfilling social experience that allows you to meet like-minded individuals from around the world—you just need to say goodbye to computer opponents and join Chess.com, the most frequented chess site on the internet. Their iOS app, Chess – Play & Learn, can be downloaded for free, and it gives you quite a lot of functionality. First and foremost, you can play against anyone you happen to find online at any given time. Measure your strength against chess players from Japan, Brazil, Russia, China, Czech Republic, or your own country. Add them as friends, send them messages, and arrange rematches. Even if someone manages to defeat, you have over 65,000 chess puzzles and thousands of videos and interactive lessons from top chess players to help you get better and win the next time. There are in-app purchases, which unlock extra features, but the free version of the app offers so many features and so much high-quality content that you can easily get by without them. With Play Magnus, you can take on the current World Chess Champion, Magnus Carlsen. Magnus was born in 1990 in Norway, and he quickly emerged as a chess prodigy, earning his grandmaster title in 2004, at the age of 13 years. In 2013, Carlsen became World Champion by defeating Viswanathan Anand in the World Chess Championship. A year after that, Carlsen defended his title against Anand, winning the 2014 World Rapid Championship and World Blitz Championship. In 2016, Carlsen defended his title against Sergey Karjakin, a Russian chess grandmaster. Play Magnus uses a chess engine modeled by Magnus Carlsen himself. Those who manage to win have the chance to qualify to play Magnus Carlsen Live at a secret location. You can select how old you would like the virtual Magnus to be, which affects the difficulty of the game. But if you think that playing against young Magnus will be a piece of cake for a seasoned chess player like you, wait until you finish your first game. At 10, Magnus made his first attempt at an international Master qualifying group. At the heart of Chess Pro with Coach is a simple concept: make a move and the app shows you four best moves a grandmaster would pick. It sounds simple, but it’s actually an incredibly effective way how you can hone your chess skills. Complete beginners can use the included chess rules as a handy reference, and experienced players can crank up the difficulty of the Chess Tiger engine the maximum level and experience what it would be like to play against a chess grandmaster. You can choose from 15 stunning visual themes, 9 chess sets, 14 board styles, and 4 different playing styles. The app lets you customize many aspects of the game, and there’s a huge collection of over 6,000 famous games played by the world’s greatest players. 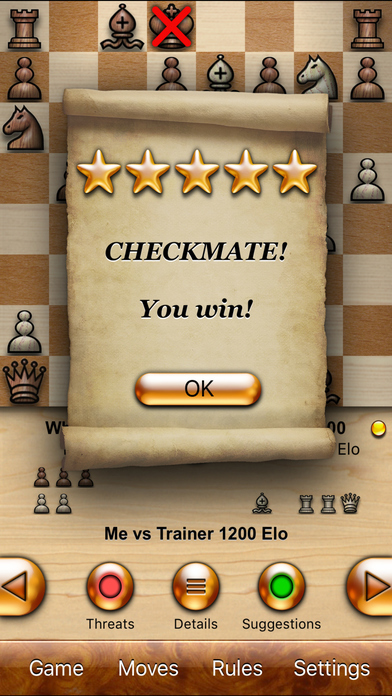 As one of only a few apps on the App Store, Chess Pro with Coach has a fantastic total customer rating of 5 stars. These days, it’s harder than ever to get young kids interested in chess. YouTube, Twitch, smartphone apps, memes, video games, and other forms of entertainment are soaking up what little attention kids have, making it more difficult for parents to show them the timeless appeal of games like chess. Chess for Kids features fun cartoon characters that explain rules of chess and help little chess players get better. The game features over 1,000 tricky puzzles, kid-friendly explainer videos, and chess bots suitable even for the youngest players out there. What’s best, the game is completely ad-free and 100 percent safe for kids. As you can see, there are a lot of great Chess games on the market. Most of these play the same, except for the ones that attempt to introduce children to the game of Chess. These are some of the best Chess games that you can download, however. Do you have a favorite Chess game you go back to regularly? Let us know in the comments section below — we’d love to hear from you!